Let’s start off with the obvious: THE CANCUN HEAT. 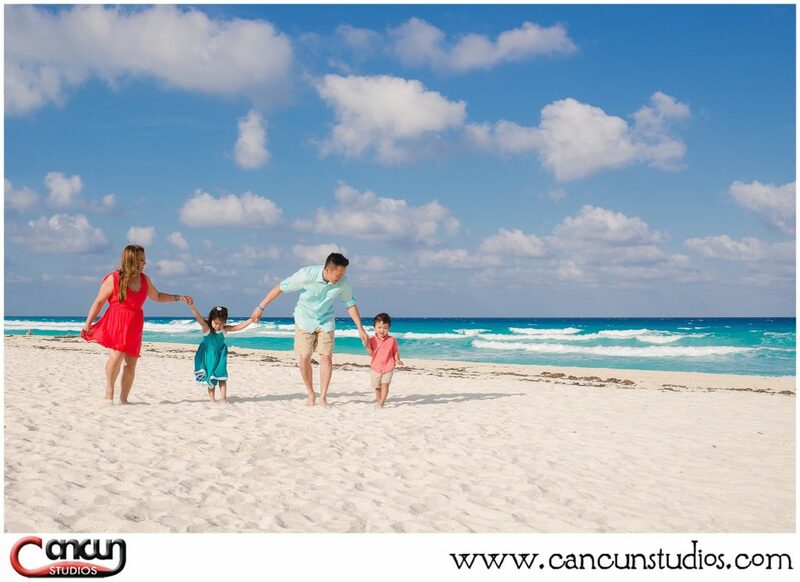 Whether you’re visiting in the heat of August or the “mild cold” (aka not-cold-at-all) of December, Cancun features the warm blessing of an eternal summer. Expect to sweat! As nice as it can be to get ready in air conditioning or with a fan directly on you, the moment you step out of that comfort zone, you will begin to sweat. 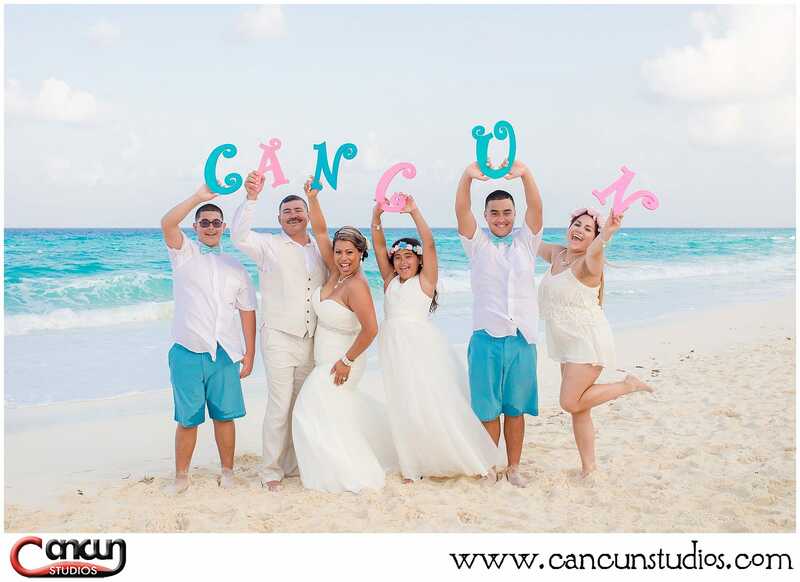 And throughout the Cancun beach photo session, every individual will be in constant movement. No matter the time of day, simply be ready to sweat! For this, don’t forget to bring sweat rags and water to keep hydrated! Also, the sun can be extremely strong, so be ready to squint. We have techniques to avoid the squinting action in our photos, but we are very aware that this will happen and acknowledge the sensitivity to light. Although we prefer to avoid sunglasses in pictures, you can bring them as a prop or to wear when you aren’t being photographed. Most days at the beach tend to be windy, with this in mind, wear a style that will keep your hair as back and out of your face as possible! Although it can look amazing, it is ideal to avoid having your hair down due to windy situations and possible sweating on your back neck area. Wear waterproof makeup. The sun may cause teary, squinty eyes due to light sensitivity, and the sweat can cause makeup to run or blotch on your face. We will be on the lookout to make sure you look your absolute best for the photos, but this tip is a good way to prepare. As for clothing, be conscious of the wind and how that can affect the way your dress, blouse, or skirt may behave. In an attempt to avoid exposed bra straps or surprise flashes, try to wear clothes that don’t reveal your undergarments. Also considering the heat, our main suggestion is to try to wear dry-fit shirts or clothing that can easily soak up sweat. Sweat can create visible sweat marks that will show up in the photos. 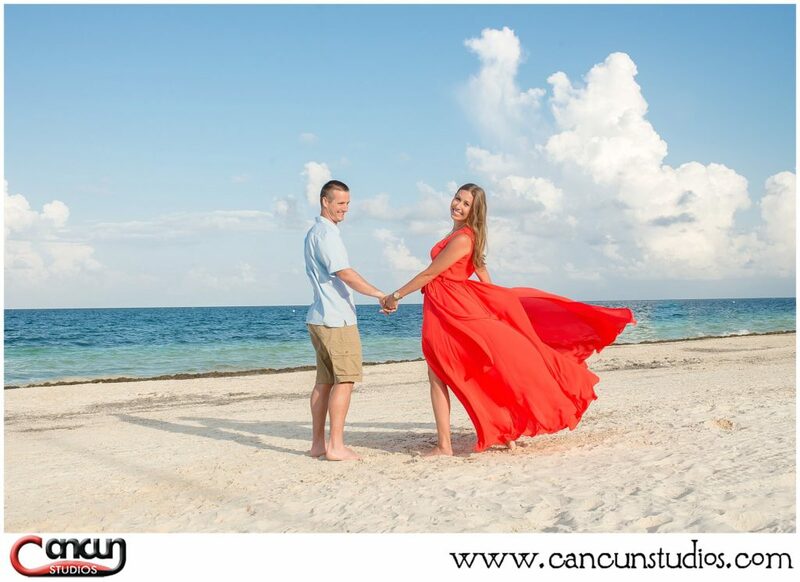 When choosing the outfits for your Cancun beach photo session, we highly recommend colorful clothing and to stay away from patterns! 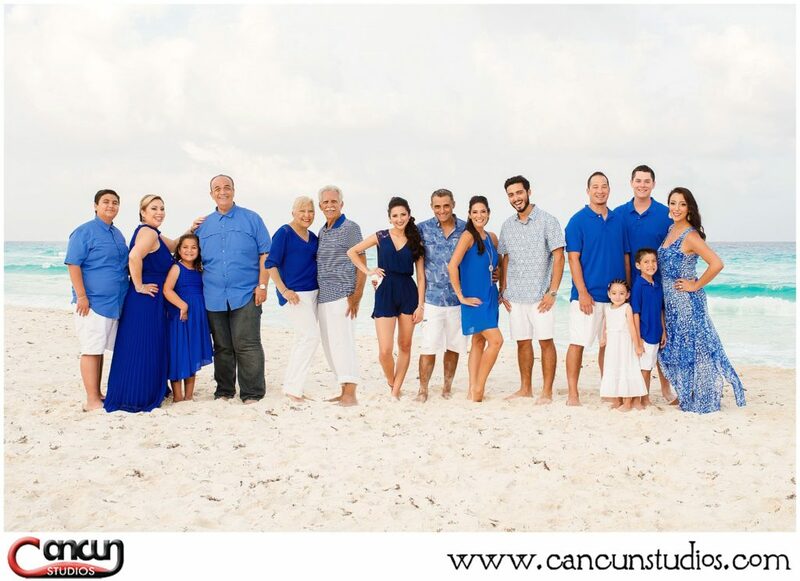 The blue of the ocean and brightness of the sand can make your color choice pop and we love the liveliness of different hues in our photos. Additionally, an outfit may seem complete with shoes, and it is completely up to you to bring them or not, but we suggest to leave the heels and fancy shoes at the hotel as the session will be barefoot. 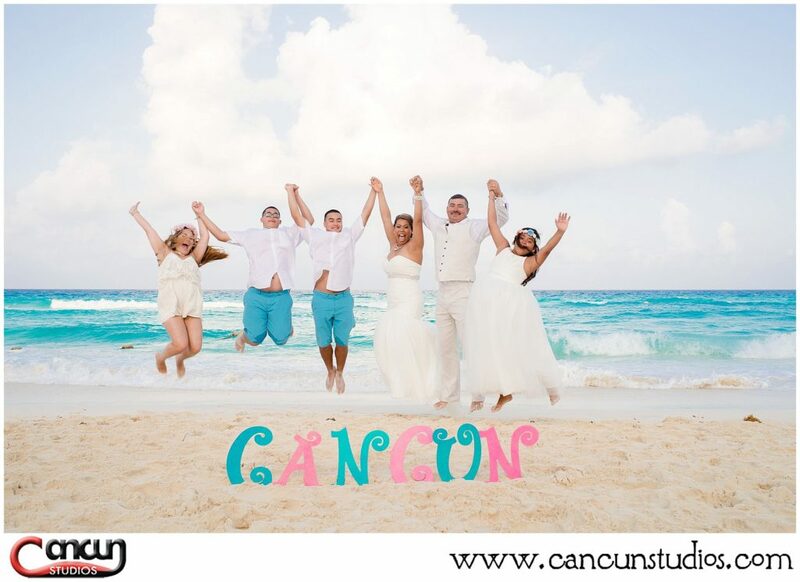 We hear sand is a natural exfoliant, so let yourself be pampered by Cancun’s beautiful beaches and embrace the freedom! Also, a big tip we want to suggest is to bring an emergency kit! This can be packed with bobby pins, safety pins, extra buttons and sewing items, rubber bands, anything that can come in handy for any type of wardrobe malfunction or unexpected accident. 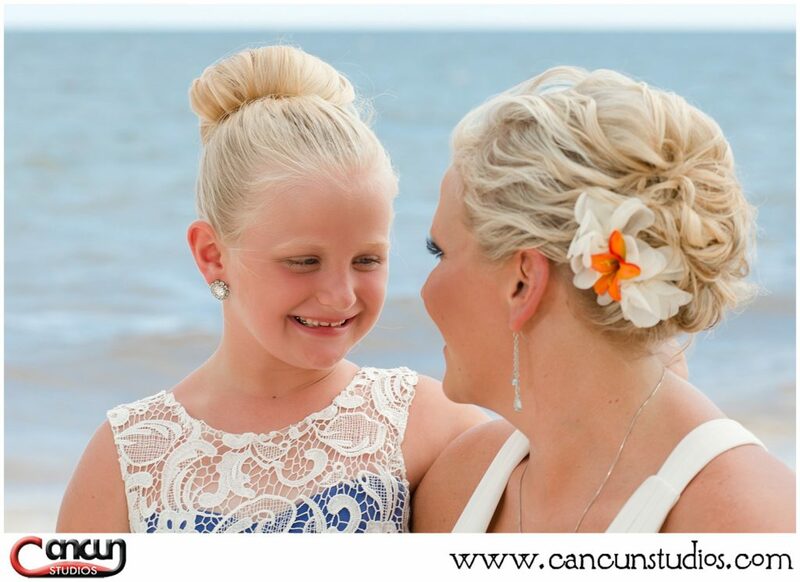 These are actually great days for photographing a Cancun beach photo session! Since the sun is not so harsh on the eyes and skin, these cloudy days can sometimes even be better than sunny days. Also, it is not a reason to reschedule. The only time we will reschedule a beach photo session is if it is raining. Keep in mind that rain is sporadic in Cancun; if it rains in the morning, it can totally clear up in the afternoon. Knowing this, we won’t make the decision to reschedule until about an hour and a half prior to the session. Expect to HAVE FUN! Our photographers are wonderful and highly experienced; they will make sure that you enjoy the session and have wonderful memories to hold on to. You are welcome to bring your own props! These can be as simple as matching sunglasses to elaborate signs on a tiny chalkboard or letters that spell out C-A-N-C-U-N to really show people where you went! Also, if you have your own ideas for pictures, feel free to bring them up at the end of the beach photo session. But, give the photographer a chance to perform and surprise you with their own skills, experience, and ideas. Trust us, we know what we’re doing. 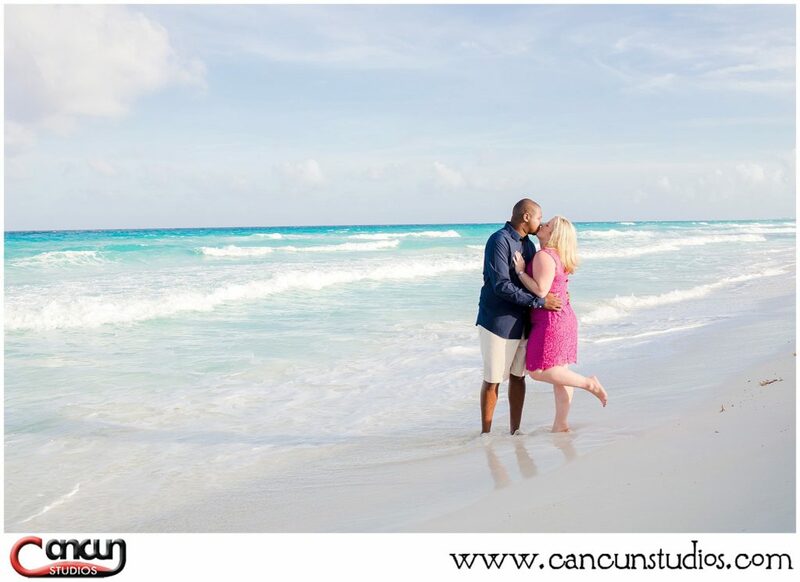 We hope these tips can better improve your comfort and readiness for a Cancun beach photo session and hope to be the ones to working with you to create amazing pictures and beautiful memories.